Want to bring home restaurant style flavor and have it on the table in less than 25 minutes? 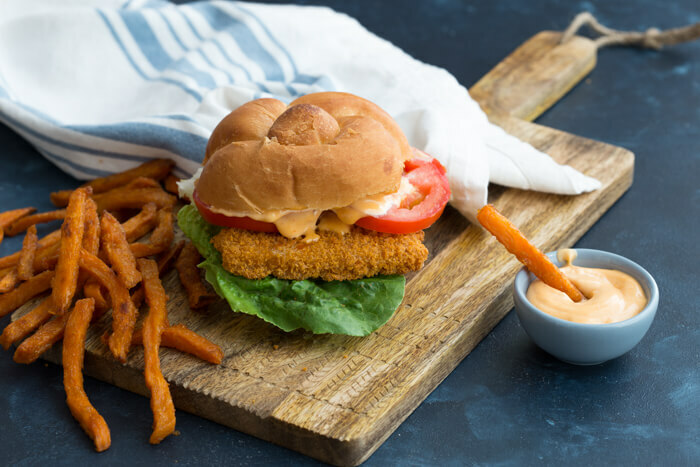 Get this Crispy Fish Sandwich with Sriracha Mayo Dressing on the menu! This sandwich is layered with Gorton’s 100% Alaskan Pollock, fresh romaine lettuce, juicy tomatoes and red onion on a hearty bun. There’s so much to love about this sandwich! 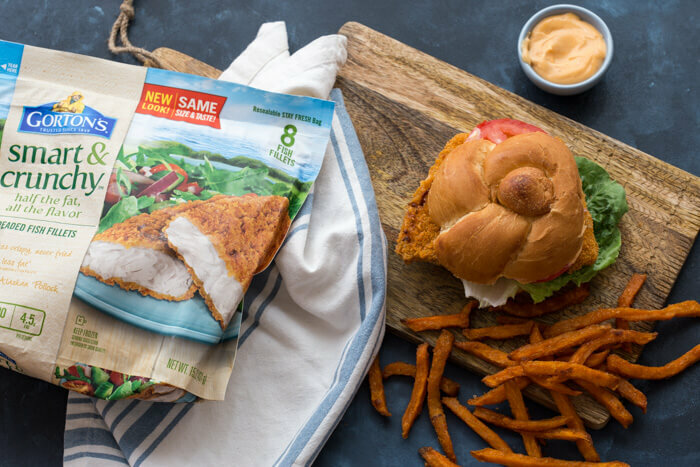 Fresh veggies, warm and crispy fish, and sweet-n spicy mayo. Ahhh, get in my belly. And what’s even better is that it’s high quality and healthy! I get all happy when quality, nutritious food meets super simple. Seriously this recipe has like 5 minutes of hands on time and the rest of the magic happens in the oven thanks to these ready to bake breaded fish fillets from Gorton’s. With such simplicity, even someone who has never prepared fish, can feel confident in making these and rest assured that they will taste amazing too! 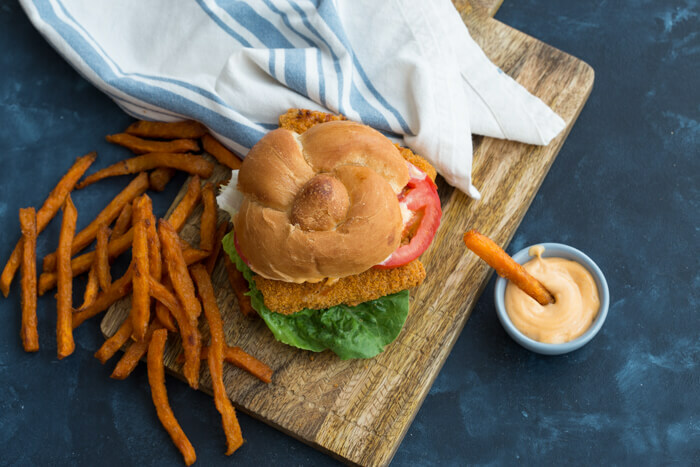 We could all use a little more seafood in our diet and this Crispy Fish Sandwich with Sriracha Mayo Dressing is a delicious, hassle-free way to make that happen. Fatty fishes like pollock are an excellent source of omega-3s which are essential fatty acids the body needs for health. 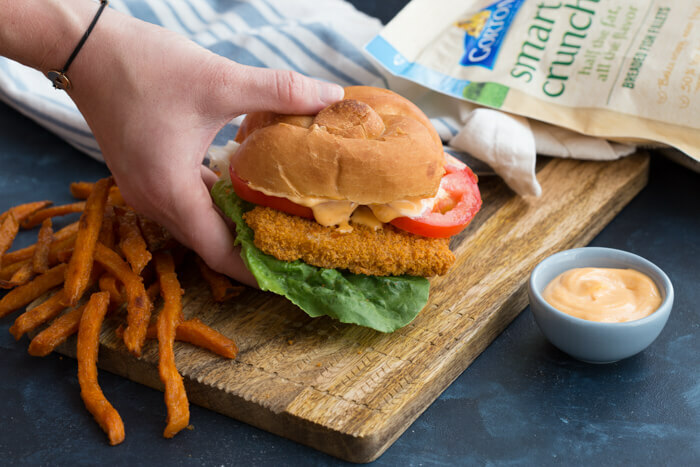 One 3 ounce serving of pollock contains 460mg of omega 3s, and this crispy fish sandwich will help you meet the recommended two to three seafood meals per week. 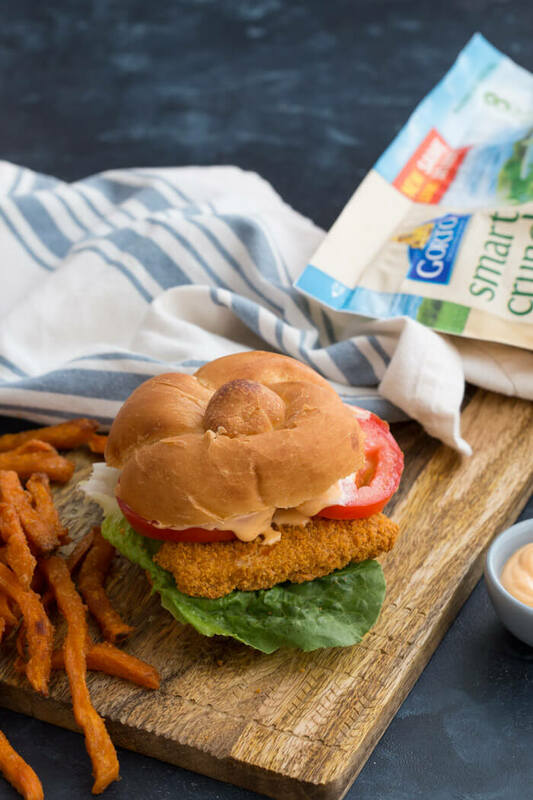 No need to worry about what you will make for the kids while you’re enjoying your dinner because this Crispy Fish Sandwich with Sriracha Mayo Dressing is a crowd pleaser; just leave out the Sriracha if the littles aren’t a fan of spicy food. Add this quick and easy weeknight kid friendly recipe to your back to school dinner menu! Dig in! Bake fish fillets as directed on the packaging. Slice tomato and onion to desired thickness. Wash romaine lettuce, pat dry and break in half to fit on sandwich. To prepare the spicy mayo, mix mayonnaise, honey and sriracha together and spread on bread. Layer sandwich with 2 crispy fish fillets, tomatoes, red onion, and romaine lettuce. What about the fries? the fries in the picture looks really great too with the sauce! Those are baked Alexia Sweet Potato Fries–so yummy! I can practically taste that crispy coating – WOW! This looks fantastic! This sandwich looks AMAZING and that sriracha mayo is on point!! 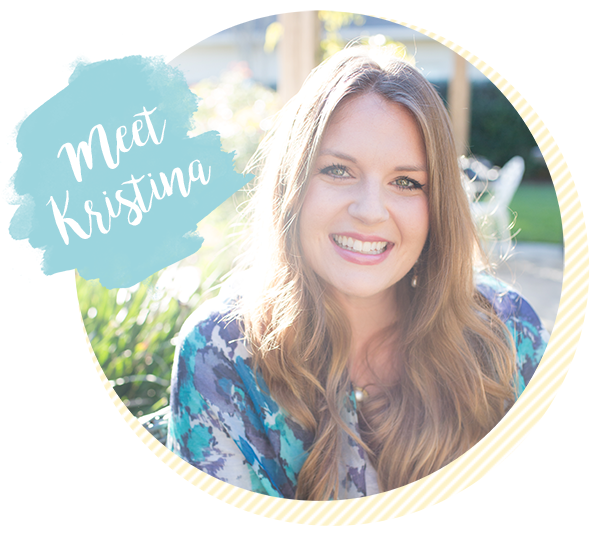 With 4 kids ages 6 and under I *always* have heathy options like this on hand in the freezer! Obviously I prefer to make things from scratch, but that’s just not realistic every day! I’ll often have a “freezer meal” meaning fun foods that I have on hand in the freezer like this when I don’ feel like cooking! Oh, this looks so good! I love a big crispy fish sandwich every once in a while!! I have to try this recipe for my husband! He always sneaks to McDonalds to order a fish sandwich and I always catch him 🙂 Maybe if I provided a better one at home, he would stop going! you had me at siracha mayo! YUM! This sounds so good. I’ve been craving seafood lately, so maybe this is what I need to make! Looks delicious! 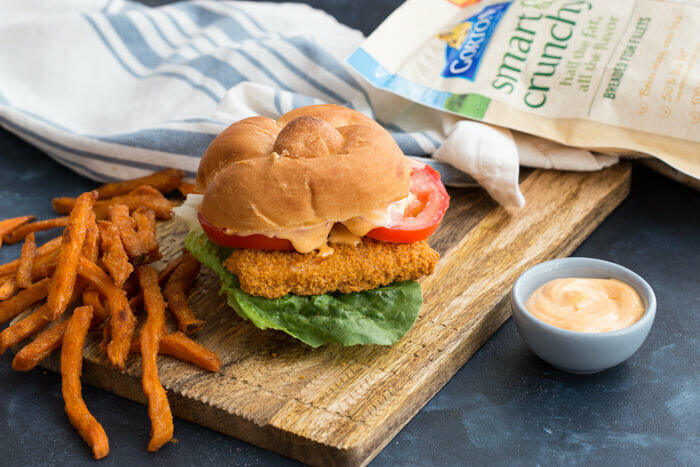 I love crispy fish sandwiches and also a big spicy mayo fan so sign me up for this meal! You had me at sriracha! The hubby has recently been into fish sandwiches, I am thinking he will love this. I’m sold with mayo + the sriracha dressing. 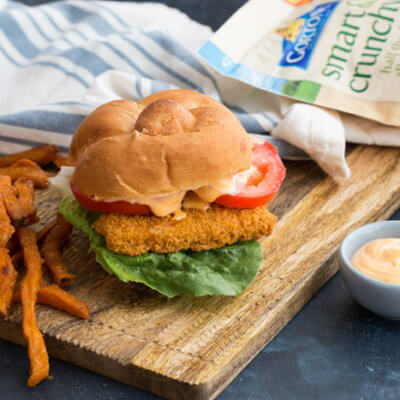 Fish sandwiches are one of my favorite easy meals, and I love that the frozen fish makes these even simpler! Now that’s a nice quick dinner. I think my husband would really like those crispy fish and in that great bun! All I need is the ocean! 😀 This sounds like such a great sandwich! 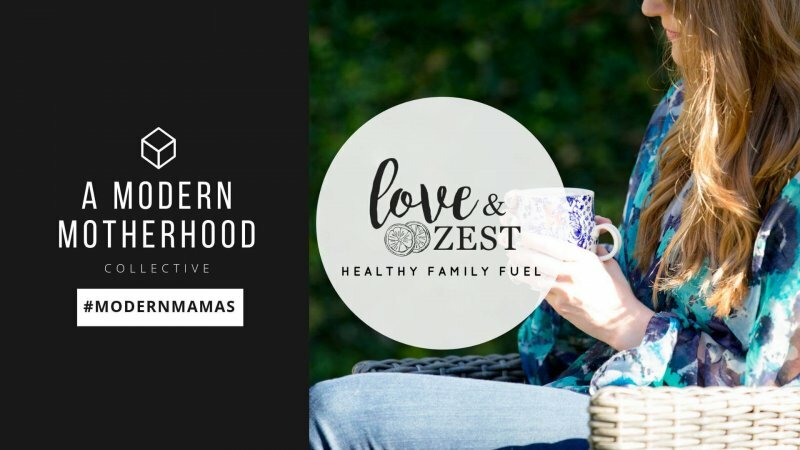 What a great dinner for busy weeknights! So easy and looks delicious! You had me at sriracha! This looks delicious. The simplicity of this is great. But the Sriracha Mayo makes it incredible! My husband will die when he sees these! You can’t go wrong with simple and healthy! I’m so on board with the spicy mayo sauce! Bring on the sriracha!